I am a proud venison eater. Just last week, I went to a dinner event – attended by more than 100 people – where we enjoyed more than 20 different entrees prepared with the harvests of many successful hunts. And each bite of food that hit my mouth was tasty. This post, though, is less about venison and more about the reasons why I have a freezer full of it. 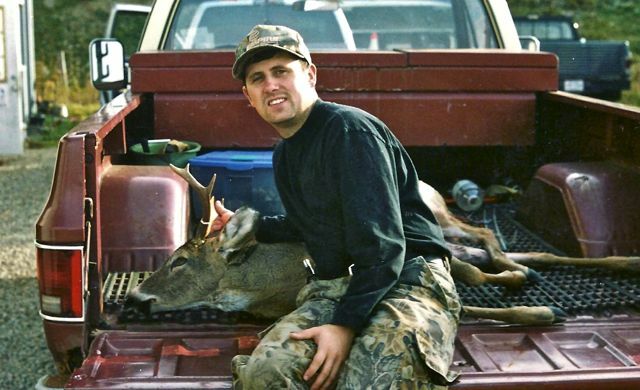 One of this blogger's early whitetails with a bow. Venison is not the reason I hunt. And I’m not looking to use it as an excuse for explaining to people why hunting deer makes me happier than a lab’s jowls lapping up peanut butter. I hunt deer because I enjoy the challenge, the time in the woods, and the sport that comes with outsmarting an old, wily whitetail. My preferred method of success is with a bow and arrow, but I don’t mind shooting a deer with a gun. The food my family gets, and the fact that it’s the most effective manner for conserving wildlife, just so happen to be great byproducts of hunting. Let that be crystal clear to anyone who’s wondering. Far too often, I find my fellow sportsmen having to defend the reasons why they hunt. That’s hogwash. No one in our country should have to defend their participation in an honest and legal sport that has roots as deep as the trees in the Redwood Forest. You might wonder why I’m a bit feisty about this topic. I just watched a propaganda-filled video being kicked around the digital world where an alleged veterinarian presents a case that bowhunting is an ineffective way to hunt deer. He spends a great deal of time pointing out that deer, when shot with archery equipment, do not die instantly. At this point, I’m hoping I hear a collective, “Naw, really?” from our readers. I have shot somewhere in the neighborhood of 25 deer with a bow. While that number might represent an “insignificant sample” in the world of research, I can tell you that my successful retrieve rate for bowhunting is better than my own rate with a gun. I know that reams of data exist to point out a variety of metrics on what is the best way to kill a deer. Articles published on the topic are probably in the hundreds. I can read all that until I’m blue in the face, but what matters to me is the experience I’ve had in the woods. That is my first-party research. I assure anyone who reads this and might question otherwise that a compound bow is more than effective at placing a lethal shot on a whitetail deer. Is every shot lethal? No. Much like hunting with a rifle, a shotgun or a sling shot, hunters are not perfect. Heck, even Peyton Manning throws interceptions. While it’s not a pretty point to make for some, that too is part of the sport. While you think about that, I’m headed to the kitchen to cook some venison chili. It’s not too often that you look back at a fruitless hunting season and be thankful. And I’m sure Luke Pearson wasn’t all-too excited when his North Carolina turkey tags never saw the light of day last spring. Fast forward a few months and Pearson might win a hunting trip thanks to his family’s struggles with toppling a turkey.